New replacement right hand battery side for AT11065T. For Dubuque tractors 330 430 440. 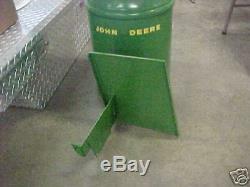 The item "Battery Box For John Deere 330 430 440 Tractor" is in sale since Friday, September 9, 2011. This item is in the category "Business & Industrial\Heavy Equipment, Parts & Attachments\Heavy Equipment Parts & Accessories\Antique & Vintage Equipment Parts". The seller is "w-farms" and is located in Logansport, Indiana. This item can be shipped worldwide.